INTERNET DRONES is a project that aims to highlight the issues, aesthetics and artistic trends of the last generation influenced by the massive use of new technologies and the internet. We’re going to spend some time on this. INTERNET DRONES deserves definitely some attention for several reasons. The first one is that the people around this Ultra project is creating a new cultural enviroment – independent from the local habitat. The second reason is the hypertextual structure of the post internet art. Given that the production is mainly online, you’re expected to look up for each one of the artists participating to this exhibition. The problem is that the hypertextual structure has no time and space limitations – like Chinese boxes bigger on the inside – and this is extreme when the artists want to make a reference to the batch capabilities of their algorithms. The exhibition is hosted by the eflux studio, a crossmedia design agency (and vintage Macintosch museum) in Udine, headed by Marotta and Russo, professors of the Academy of Fine Arts of Venice. To get there you have to book a visit at least one day before, it’s for free ( like the best things in life). Stefano Monti guided us through the whole exposition, making sure we viewed all the videos in their entirety and telling us incredible art adventures. The drone theme looks like an excuse to involve a hot topic, the main discussion is about the object of art, the “thing” you pay for, the “thing” you own or the “thing” you consume. This work recalls the glorious demoscene. It’s made of 128 online compositions floating rectangles made in css, painted in gradients . The elegance of the simplest and cleanest shapes and colors of this ideal spaces is well tuned with the ethereal movements. The resulting image is a concert of tri-dimensional isomorphous and vectorial transcendent structures. The contemporary art theme “to remove or to put on” rearranged to get into the humble space of the demoscene has a different meaning and flavour. The “mass” is in the code (25 KB) then the lightness flows into the composition and colors of the image(285 KB on my laptop). The contemporary art theme “to add or to remove” rearranged to get into the humble space of the demoscene has a different meaning and flavour. The glitch art is transposed to the analogical photography. The artist on his computer gets between the visualization and the contents, modifying the result of the visualization with “alchemical” algorithms. Doria does the same with the photography. The visualization of a picture on film is obtained by projecting on photographic paper. He acts on this procedure, bending the light through partially transparent materials and creating uncommon images. 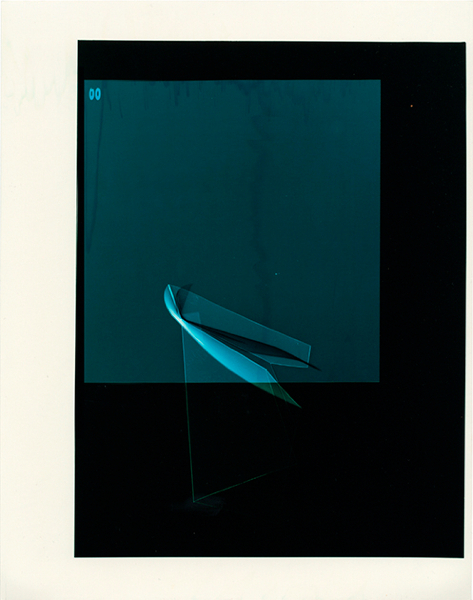 He acts on this procedure, bending the light through partially transparent materials and creating uncommon images. The frustration of the act of deciphering a code is given to the visitor in an AV format. A code that involves series of small videos, images and sounds hiding a secret message that nobody knows (except for Rosa). Just visit her blog. The pictures on the wall are physical keys to the online contents. These buildings came from the abstraction of the materialization of luxury. The top of the skyscrapers represent the highest ambitions (power, money), the futuristic architectural rendering of the tallest and cleanest buildings are the idealizations of the highest buildings in the world. The virtualization of the concept (into the 3D model) is replacing the process of the idealization. The frustrated reaction of the user/viewer is mixed with a strange attraction. The virtualization of the concept (into the 3D model) is replacing the process of the idealization. The series of short animations represents revolving eggs mixed with alien formations and geometric features. The shape of the egg is explored and morphed to the limits, until the transformation into bird. The artist explores the recreation of the nature laws into a digital space ending up with a collection of animated jewels close in concept to Fabergè eggs. The shape of the egg is explored and morphed to the limits, until the transformation into bird.